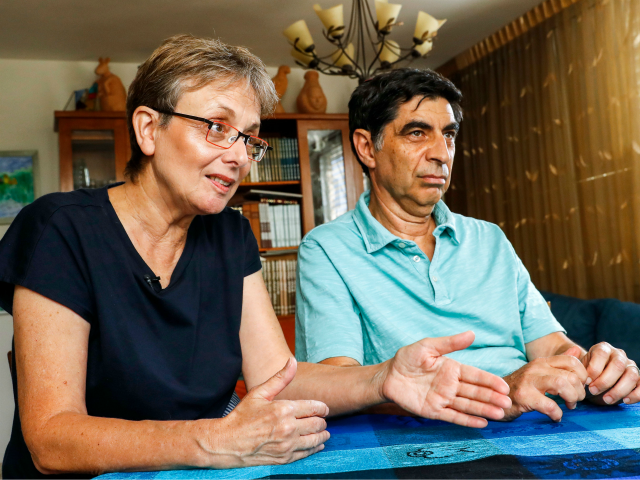 KFAR SABA (ISRAEL) (AFP) – Leah and Simha Goldin have been thrust into an unwanted spotlight — but all they want is finally to be able to bury their son who served in the Israeli army. From their living room in central Israel, surrounded by books and family photos, they have waged a years-long campaign to bring back the remains of Lieutenant Hadar Goldin, a soldier killed in the 2014 Gaza war. Their efforts have received increased attention in recent weeks as mediators seek a long-term truce between Israel and Gaza’s rulers Hamas, the Palestinian Islamist movement believed to be holding his body. “This thing that’s in our hearts — to run around with a knife in our hearts — has been forced upon us,” said Leah, a computer scientist. “We’re not diplomats. We’re not legal experts,” she said at her home in Kfar Saba, north of Tel Aviv. The Goldins argue that Israel’s government has not done enough to bring back the remains of their son. They say a long-term truce deal with Hamas that does not guarantee the return of their son’s remains would be a mark of shame for Israel and an insult to the family. Hadar Goldin’s remains and those of another soldier killed in 2014, Oron Shaul, are believed to be in the hands of Hamas. Two Israeli civilians — both reputed to be mentally unstable — are also believed to be in Hamas custody after entering the blockaded Gaza Strip. The Islamist movement has mooted the possibility of an exchange, but the price would likely be high. In 2011, Israel traded over 1,000 Palestinian prisoners for the release of Gilad Shalit, a soldier held captive in Gaza for more than five years. Last year, partly in response to the Goldins’ campaign, Israel imposed new restrictions on the Islamist group, including refusing to return the bodies of its militants. “It’s first and foremost the Israeli prime minister’s responsibility, the same one who sent Hadar to war,” said Leah. The family has organised events to raise public awareness, including exhibitions of Hadar’s colourful paintings of landscapes and people. They attend parliamentary discussions on their cause and meet with ministers and lawmakers. Supported by former Canadian justice minister Irwin Cotler, they have participated in sessions at the United Nations Security Council and the European Parliament. Leah has vowed to keep up her efforts — “even if I have to reach Gaza” — not just for her son, but for soldiers “who will fight the next war”. Hadar Goldin was part of a team of Israeli soldiers in the southern Gaza Strip on August 1, 2014 trying to find and destroy militant tunnels. A 72-hour humanitarian ceasefire had been declared that morning, and as a result Israel says Goldin’s team was prohibited from using weapons during their search except in the case of immediate danger to their lives. According to Israel’s military, the soldiers came under fire from Gaza militants who killed Goldin and took his body into a tunnel. Two other soldiers were also killed. Israel’s military did not know at the time if Goldin was dead or alive, and it launched a massive operation to find him and attack militant posts. The assault came to be known as “Black Friday”. The war would end later in August without Goldin’s body being recovered.